The Haberstroh family started the hot pepper challenge to raise money for ALS research. WESTPORT — On Oct. 18, Patty Haberstroh got news no person hopes to receive in her lifetime. She was diagnosed with amyotrophic lateral sclerosis, colloquially known as Lou Gehrig’s disease, a neuromuscular degenerative illness that causes muscle atrophy and the eventual loss of all voluntary muscle control. 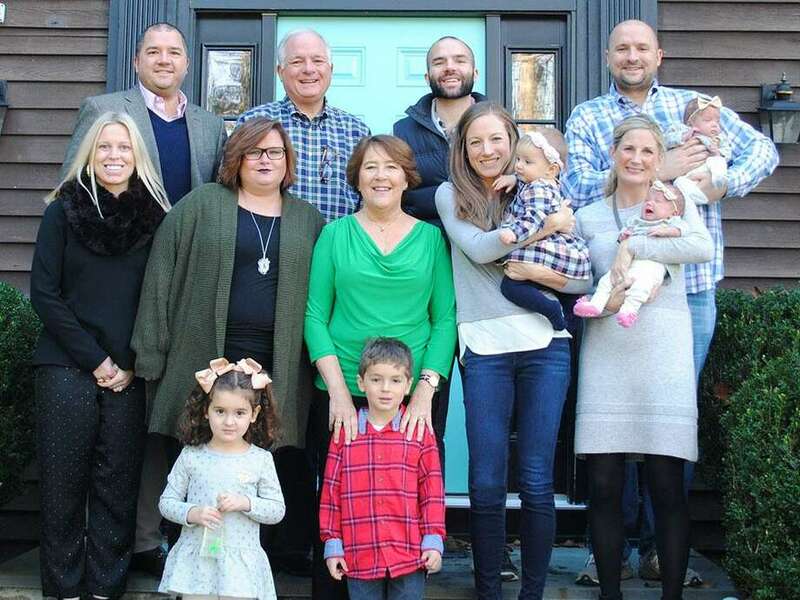 When Haberstroh, a Westport resident since 1990, told her husband, Charlie, and their four children of the diagnosis, she said they were understandably upset, but vowed do something and felt they could make a difference in fighting the disease. “When our mom got diagnosed, it was really hard for us, but our family is not one to just let it happen,” Haberstroh’s daughter, Kim, said. “We are a family that fights for a cure, and ALS doesn’t have a cure,” she said, adding her mother is everything to her and her three brothers. The family wanted something similar to the 2014 Ice Bucket Challenge ALS fundraiser. Patty loves peppermint patties, so the family built on the “pepper” theme and created the hot pepper challenge in which participants have to eat a hot pepper or donate $100 to ALS research. On Christmas, five core Haberstroh family members — the clan now encompasses several spouses and five grandchildren, as well, made a video to launch the hot pepper challenge. Their faces turned red as each member ate a pepper and soon the whole family broke out into smiles and laughter. The family chose the ALS Therapy Development Institute in Cambridge, Mass., to be the beneficiary of the challenge donations because the nonprofit biotech organization is focused 100 percent on ALS research. “ALS (patients) have an average lifespan of two to five years, so there’s great urgency in raising this money,” Patty said, explaining the family set a 1 million-dollar fundraising goal because that’s what it takes to get a pharmacy drug into a human trial. There is no human trial for ALS drugs. “ALS is not an incurable disease, it’s an underfunded one,” Patty said, adding only one new ALS treatment drug has come out in the last 20 years. The drug, Radicava, was approved by the Federal Drug Administration in May and, for a small portion of people living with ALS, can slow muscular deterioration by 33 percent. In mid-February, Patty began Radicava treatments. “We’re also realistic. We’re not expecting a miracle. Radicava is not a cure,” Patty’s son, Tom Haberstroh, said in a February Facebook post, writing why his family is so motivated to raise money for new ALS drug research. “We never thought it was going to be as big as it is,” Kim said. Thanks in part to Tom’s connection to the sports and entertainment industry: He formerly worked for ESPN and has strong ties in the industry, and many celebrities such as Kelly Clarkson, Jimmy Kimmel, Garth Brooks and Shaquille O’Neal have participated in the challenge, which has raised $479,329 as of Feb. 20. “It’s great to have celebrities participate, but the ones that bring a tear to my eye are the ones from home,” Patty said. An employee in Westport’s Human Services Department, Patty helps connect low- and moderate-income families in town with services. It wasn’t long before Town Hall lit up with hot pepper challenge participants, including First Selectman Jim Marpe and his wife, Mary Ellen, who are longtime friends of Patty and Charlie Haberstroh. “I think what’s important here is the spirit with which the entire town has embraced this fundraising idea and how it reflects an understanding of Patty’s many contributions,” Marpe said. Patty’s husband, Charlie, has also been a key volunteer in town politics in positions on the Board of Finance, Sunrise Rotary and Board of Selectmen, among others, and rallied many town groups to participate. Some of the most effective challenge videos have come from friends of the Haberstroh siblings, Kim said, adding Patty was like a second mom to many of her and her siblings’ friends in Westport growing up. Although for two weeks every month Patty has to travel to Bridgeport each morning to get hooked up to IV bags for an hour to receive her Radicava treatments, she vows to continue her work in human services as long as she’s able.